Sometimes something comes along that changes everything: When Willie G. Davidson rode the Fat Boy® model into Bike Week the first time, let’s just say it stopped traffic. No one had ever seen a factory custom motorcycle with this much visual impact before. The look was pure Harley, yet totally new. In the years since, the Fat Boy hasn’t let up. 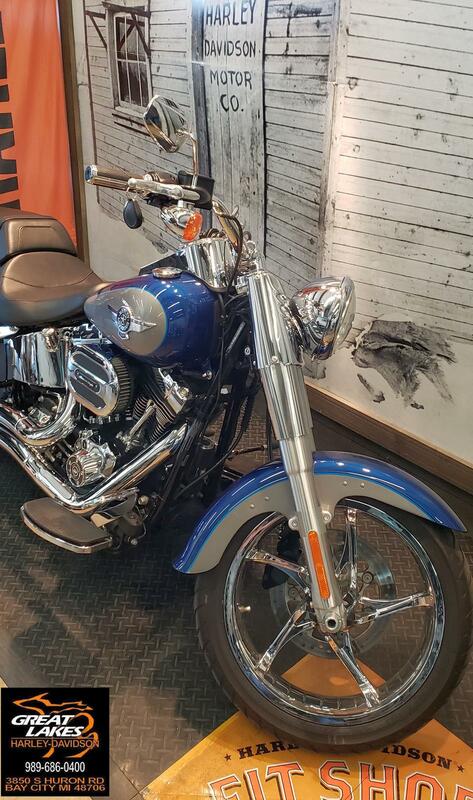 From the chrome of the solid disc wheels, to the muscular lines of the new High Output Twin Cam 103B™ engine to the curve of its distinctive rear fender, this machine is built to make an impact. Ride one and you’ll understand. Fat Custom Style: Recalling the "hardtail" choppers of the '60s and '70s, the Fat Boy® motorcycle keeps that heritage alive more than forty years later. This is the original "fat custom" bike - laid-back and luxurious with an unmistakable profile on the road. But the nostalgic style isn't just about the confident stance, chrome and old-school detail. It's how you look riding it. It's how it feels. It's the classic, relaxed riding position. You're not just cruising. You're in charge - kicked back on a throne of machined metal surveying your domain. Mirror Chrome Wheels: These Mirror Chrome Bullet Hole Disc wheels speak for themselves. So this is the iconic look for the Fat Boy® model. You can roll with gleaming eye-appeal that's thick with legendary Fat attitude, right off the lot. Hidden Rear Shocks: If you want a comfortable bike but love that rigid-suspension look, you've come to the right bike. We've kept all the modern comforts where they belong: below the surface of a rad, vintage-looking bike. You get the classic lines of a vintage "hardtail" frame with the horizontal rear shocks hidden in the guts. 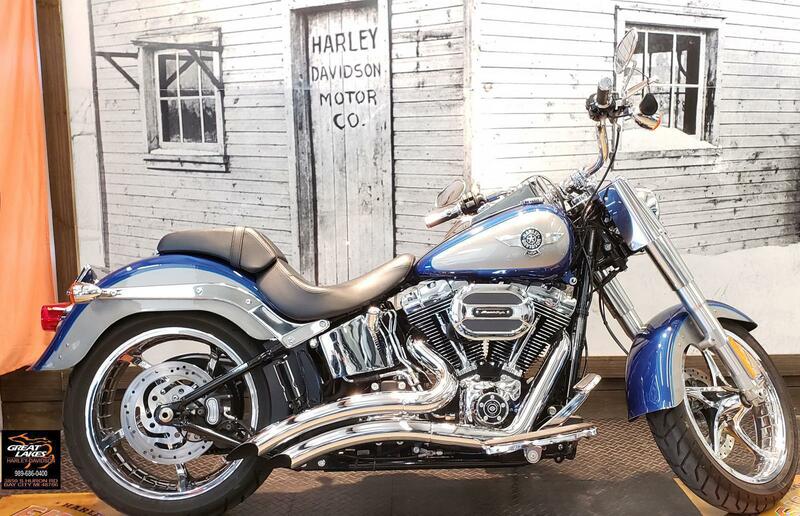 It's a signature rigid look, and you'll only find it on a Softail® model. Pure Harley-Davidson Styling: Feast your eyes on the High Output Twin Cam 103B™ engine and there's no mistaking its roots. This is authentic Harley-Davidson style through and through with an attention to detail you won't find from any other motorcycle company. Black powder-coated heads and cylinders are highlighted by machined cooling fin tips and chrome rocker covers. It's a jewel machined out of metal. Pure. Dripping with power. From the classic edge of the cooling fins to the clean lines of cases and covers, the High Output Twin Cam 103B™ engine makes an ironclad statement about holding on to what's right and staying true to what satisfies. High Output Twin Cam 103B™ Engine Power: Asking riders if they'd like more power is like asking them "Would you like more beer in the pitcher? " when they've reached the end of a long day tearing up the roads. Everybody wants it, and the High Output Twin Cam 103B™ engine is 103 cubic inches of Harley-Davidson V-Twin you can rely on to deliver it. The airbox increases intake airflow and the cam optimizes phase and duration. The result: better low-end torque and faster 60 to 80 mph 5th gear roll-on to get you around that 18-wheeler. In other words, it gets you motivated in a hurry. 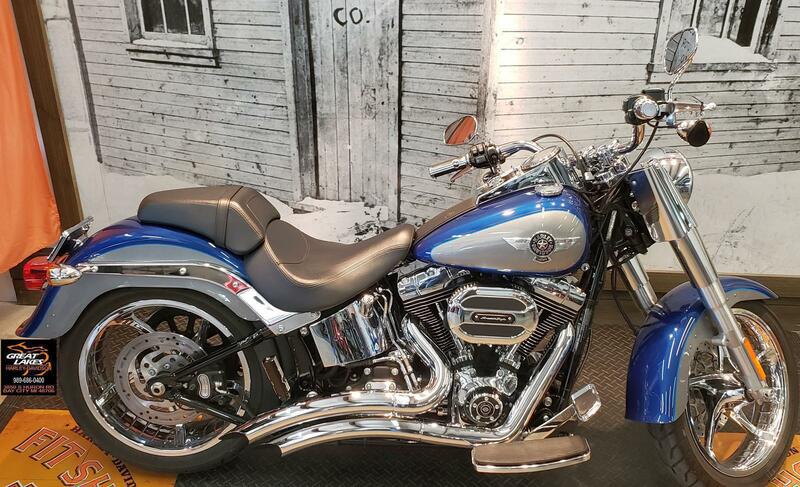 In the tradition of the legendary Harley iron that came before it, the High Output Twin Cam 103B™ engine is once again raising the bar for the feeling an engine delivers to the rider. There's a reason we're called the Harley-Davidson Motor Company. Once you send some fuel to this engine, you'll have no doubt whose it is. Electronic Throttle Control: The pure heavyweight style of the Fat Boy® motorcycle gets even cleaner with the addition of electronic throttle control. Take a look. There's no cable cluttering up the handlebars. Plus, the electronic set-up makes it a simple no-fuss-no-muss procedure to install Harley-Davidson® cruise control.